The NAMM Foundation advances active participation in music making across the lifespan by supporting scientific research, philanthropic giving and public service programs. The Mariachi Connection: Started in February 1996 in response to the Southwestern demand for Mariachi and Ballet Folklorico supplies and instruments. We cater to the individual, group, and schools that need specific items with regard to these areas. Through the Libraries, our students, faculty and staff are connected 24/7 to a universe of online scholarly resources, including disciplinary databases, journals, digital repositories, and even a wide variety of sheet music. Scoremore Shows: A grassroots music promotion network that prides itself in cutting edge marketing tactics with clients including corporate brands, artist management companies, and talent booking agencies. 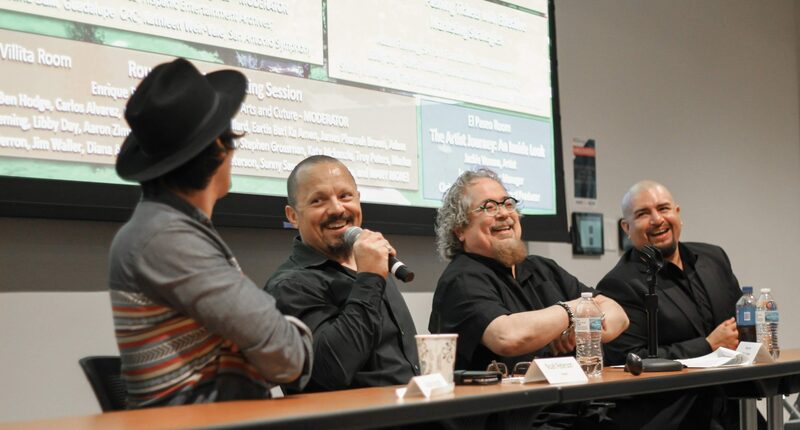 The University of the Incarnate Word is preparing to host its first music industry networking event in September of 2019. Cedar & Oak Entertainment and Events is locally owned and operated with the explicit mission of providing a worry-free experience when it comes to your event, music and lighting needs. This is accomplished through flawless execution, the latest equipment in the industry, extensive planning and clear communications. We are working solely to meet your needs and ensure your dreams come true. Musical Bridges Around the World welcomes the best and brightest artistic talent from across the globe to inspire audiences with dynamic, unparalleled excellence in the performing arts. Our performances and educational outreach programs reach 80,000 people annually for free. For nearly 30 years the Texas Music Office has served the Texas music industry. Its mission to create opportunity and connect businesses continues today. Our core functions are to serve as a clearinghouse for Texas music industry information via the TMO’s Texas Music Industry Directory (a business referral network comprised of 15,000-plus Texas music businesses), serve as a liaison between music businesses and government, publicize significant developments within the industry, and to foster the economic development of Texas music businesses and musicians. The Aztec Theatre is San Antonio’s premier historical multi-purpose entertainment and events facility. Located in the heart of downtown at the corner of Commerce St. and St. Mary’s St., the Aztec Theatre in one of the Alamo City’s most cherished architectural and historical landmarks. Considered by many as a Meso-American architectural work of art, the Aztec boasts a dramatic combination of authentic columns, reliefs and artifacts. From its stunning lobby and mezzanine to the glorious theatre and balcony, the Aztec Theatre is an experience unlike any other. The Department of Arts & Culture advocates for the growth of the local creative industry by increasing awareness of the impact and value of arts and culture to the city. Its mission is to enrich quality of life by leading and investing in San Antonio’s arts & culture. Helping to make San Antonio an exciting place to live and visit, the Department develops and markets a wide range of programs and events. These programs and events include resources such as a local music database that helps musicians find their way to gig opportunities, City Council Local Music Spotlight Program and more. Learn more at GetCreativeSanAntonio.com. Connecting college students with the industry’s brightest and most talented minds, GRAMMY U provides aspiring professionals with the tools and opportunities necessary to start a career in music. Throughout each semester, events and special programs touch on all facets of the industry, including the business, technology, and the creative process. As part of the Recording Academy’s mission to ensure the recorded arts remain a thriving part of our shared cultural heritage, GRAMMY U establishes the necessary foundation so that music’s next generation flourishes.